Blackpool 31 was originally built as a four-wheel double deck open-top car in 1901 by the Midland Railway Carriage and Wagon Co. Ltd., for use on the Marton route. In 1918 Blackpool rebuilt the car as a trial prior to embarking on the production of its ‘Standard’ cars. The body was lengthened and fitted to a new underframe; the three large windows show the extent of the original 1901 body and the small window at each end shows the amount by which it was extended. The rebuilt body was placed on a pair of English Electric 4′ wheelbase equal-wheel bogies, to the American McGuire pattern. Each carries a BTH 265C 35hp motor, and the tram is equipped with BTH 510 controllers. The car ran as an open-top unvestibuled tram until 1928, when a top cover was fitted. However in 1934 it was transferred from the passenger fleet to the Engineering Department and the top cover was once more removed. Renumbered Engineering Car 4, the tram was fitted with an overhead line inspection tower in the centre of the upper deck, with two trolley poles disposed front and rear, and driver’s windscreens were added. In the fleet renumbering of the 1960s the car was renumbered 754. The car survived in regular use in this guise, remarkably, for 50 years. Then in July 1984, it was transferred on long-term loan from Blackpool for restoration and operation at Beamish. 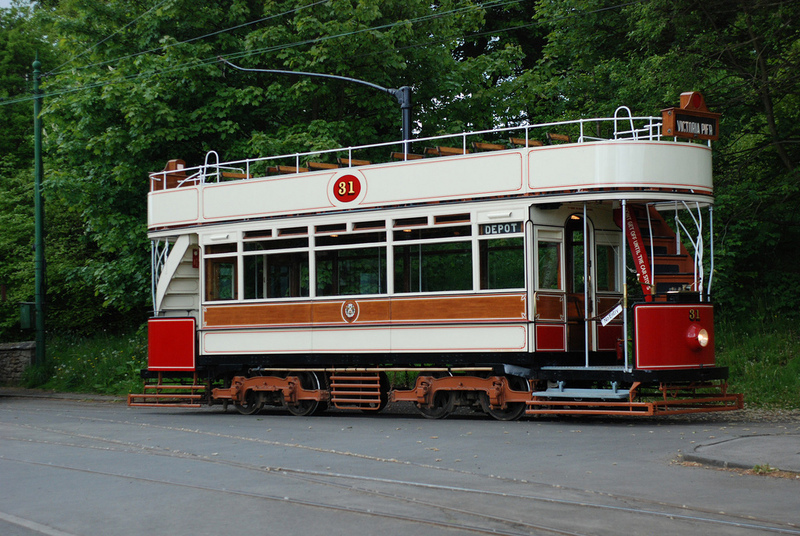 This work was undertaken over the succeeding three years in the Beamish workshops, and this very popular high-capacity tram now operates regularly every summer as open-platform, open-top double deck Blackpool tram 31 in its 1920s condition. Tram 31 however returned to its native Blackpool for the 1998 summer season to help celebrate the centenary of the Blackpool – Fleetwood Tramway, returning to Beamish the following year.